Start Here: You can customize by clicking the tabs below and editing your details/preferences. You can then change the fonts/locations of most elements by clicking on them in the product image. For more help, please reach out if you need us. Each of our American white oak barrel heads has lived a previous life aging Kentucky bourbon and is now completing its journey in the most beautiful, meaningful way possible - as your wedding guestbook. A true American classic, as unique as you are. Made from real whiskey barrels - We have a contract with a major cooperage that supplies new white oak barrels to distilleries all over Kentucky. Once they've aged bourbon in the rickhouse, they are sent back to the cooperage, who then makes sure the barrels are once again put to good use as re-purposed bourbon wood. Carefully processed and assembled by hand - The bourbon barrel heads (lids) come to us as loosely assembled slats, since pressure and good craftsmanship hold the barrels together (and never glue). In order to make sure they stay together, we've created our own process of fitting a piece to the back to hold the slats together, and adding hardware to make sure it hangs safely on the wall. Authentic and unique - Each barrel head shows distinct signs of its history in the famous rickhouses of Kentucky. Depending on which product you order, you may see the whiskey mark (stamp) or the charred wood through a viewing hole we add to our backing boards. Like every batch of whiskey, every barrel head tells its own story. We don't manufacture these - the cooperage does with a little help from some of America's best bourbons and whiskeys, so no barrel head we send out is ever perfect. You may see slats that don't line up perfectly, or there may be gaps where the wood has swollen and contracted over the years, but to us, that imperfection is beautiful. Laser Engraved, not Printed - You can see and feel the difference. Designs are laser burned in, giving depth and a contrast to the wood while also maintaining a rustic and natural look. Not just a wedding piece - After the wedding, and after this bad boy is signed, hang it up on the wall for all to see with our included wall hanging hardware. It will be a beautiful centerpiece for years to come. Designs Galore - With our builder, your options are endless. And if you have something special in mind, email us and we will make it for you. A solid piece of American craftsmanship - Weighs 12lbs and measures 21-22" in diameter and around 1.5" thick. This baby was rolled around in rackhouses and used to store 50+ gallons of bourbon at a time. It is solid as a rock and will stand the test of time. Perfect for signatures - We make sure to include enough blank space for signing. Includes a sharpie for signatures and fixative coating to prevent smears. When the barrel heads arrive in our studio they are charred and bourbon soaked – which means you can still smell smokey whiskey notes when you open your package. We prepare them for their journey by tightening the loose slats, adding a solid wood backing board to hold them firmly in place, then sanding and refinishing the top down so that it is clean, flat, and perfect for signatures. Once you give us the go-ahead, we engrave your design into the wood with our 150w laser and finish it off with a clear fixative that will make sure your guests’ messages don’t smear. The laser will give your design varying depth and the contrast of the burned/sanded wood will give it a dynamic look perfect for your wedding, and later, your home. We clean, dry, and sand it down until it’s bright and smooth – perfect for signatures. A clear fixative is added that “holds” your signatures in place – your guests can write on the wood without worrying about the ink bleeding, running, or fading. Be proud of your Guestbook - This is not a reproduction wood piece - these are the real deal - these barrel heads were once used to age bourbon in Kentucky Distilleries and made from American white oak. No inferior pine or engineered woods like others. Authentic and unique - Each barrel head has a story as unique as your own. They still have the original distillery stamp on the back which designating the the location, year, distillery and other information unique to it. There is no other barrel head like it in the world. Got a special toast planned? Want to give your wedding party (or maybe your guests) a keepsake. This rocks glass is perfect. Holds 10oz and comes laser engraved with your design. Discounts for buying in bulk. Savings applied in cart. Wedding Guestbook - Use our REAL bourbon barrel head to keep signatures and display it long after. "Bury the Bourbon" Bottle - Keep the rain away on your biggest day with this special bottle. You can also use it after for the years to come. 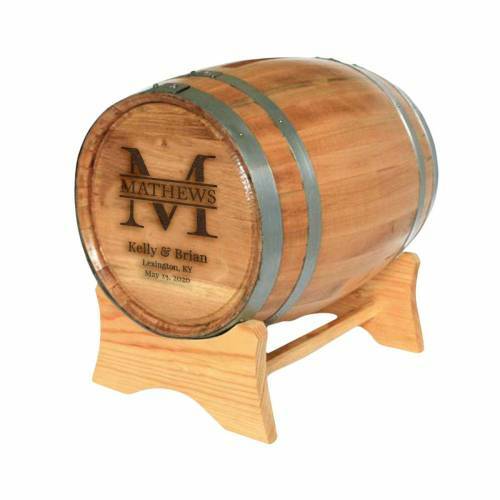 Bourbon Blending Barrel - Used for a blending ceremony or just as a vessel to serve your guests. Choose from a variety of sizes. 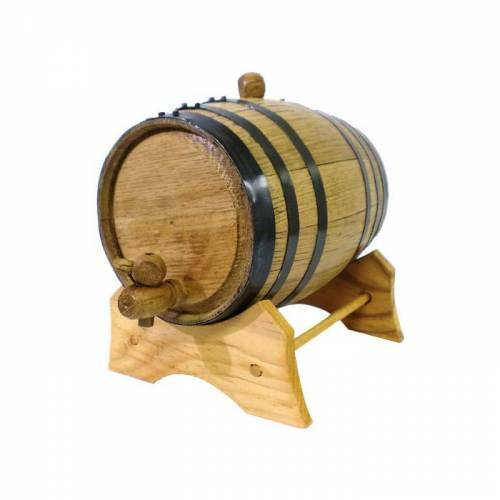 Barrel Card Holder - Collect notes and cards from you guests in this unique barrel. Engraved to match your other items. Toast glasses - Rocks glasses engraved. Use as wedding party gifts or favors for your entire guest list. 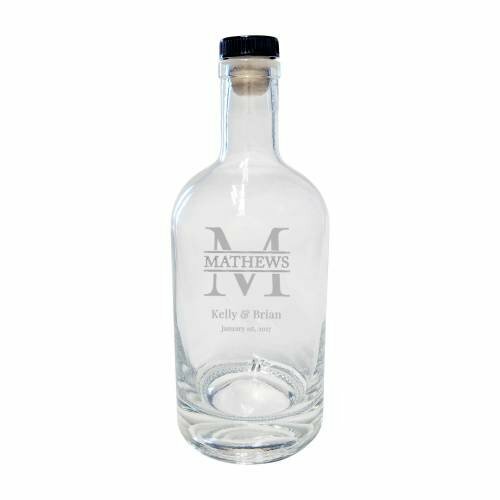 You've got your design already locked down - why not add a beautifully etched bottle you can use to bury the bourbon before the wedding? [Read more here]. Embrace this fun tradition with our high quality, thick-walled bourbon bottle with real cork laser etched to perfectly match your guestbook design. Our engraved quarter barrel is a great way to collect your wedding cards from guests and display an engraved memento. We can add the same design you've used on your barrel head guestbook, or create something totally new. Either way, you can display this beautiful piece proudly at your wedding and in your home afterwards. 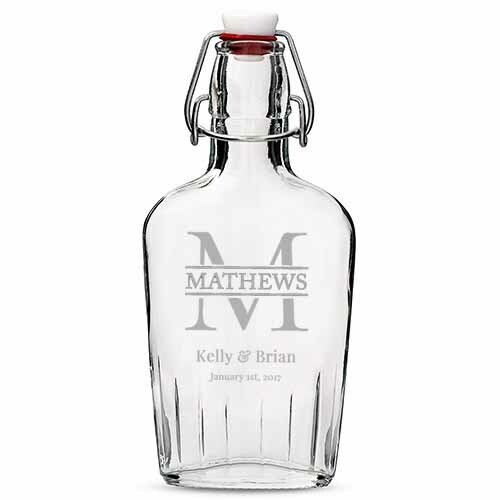 Embrace the fun tradition of burying the bourbon to keep the rain away on your big day with a meaningfully engraved keepsake bottle. Not sure about burying the bourbon? [Read more here]. 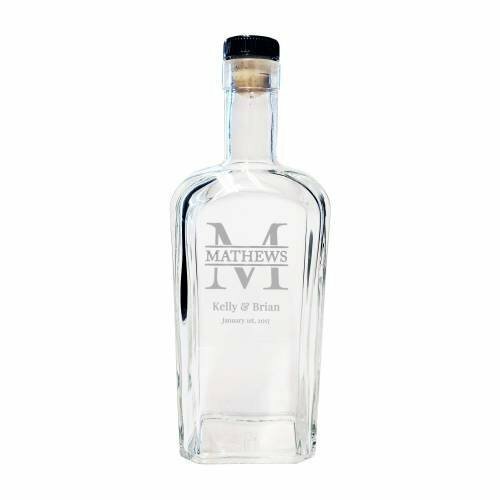 Our engraved bottles are also great for creating a special bottle to use for your wedding toast, to blend into during your ceremony, or to gift to your wedding party or a special loved one. Our curved-neck bury the bourbon bottle features a classic shape that makes it easy to grip, and also instantly conveys what's inside - your favorite bourbon. Our bury the bourbon bottles are made to be etched with your design - use the same design as your guestbook to create a matching bottle for your big day, that will become a treasured memento on your bar. Want to know more about burying the bourbon? [Read more here]. Don't flip your lid - your wedding party has your back. Our flip top glass flasks are priced to be purchased in a set, but also make a gorgeous one-of-a-kind memento. We can engrave the same design you made for your guestbook or other items, or something completely different. After you bury the bourbon, dig it up and pour some into your party's flasks. Also great for sharing a special whiskey blend created for your big day with friends and family. Another idea? 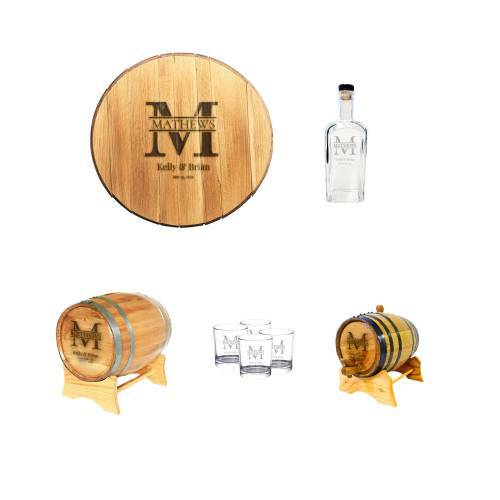 Blend in your blending barrel during the ceremony and pour some into each flask for an extremely special favor for those closest to you. Discounts for buying in bulk. Savings applied in cart.